Set back from the busy A2, Mughead Coffee offers a space to unwind. A new café has just opened in New Cross. 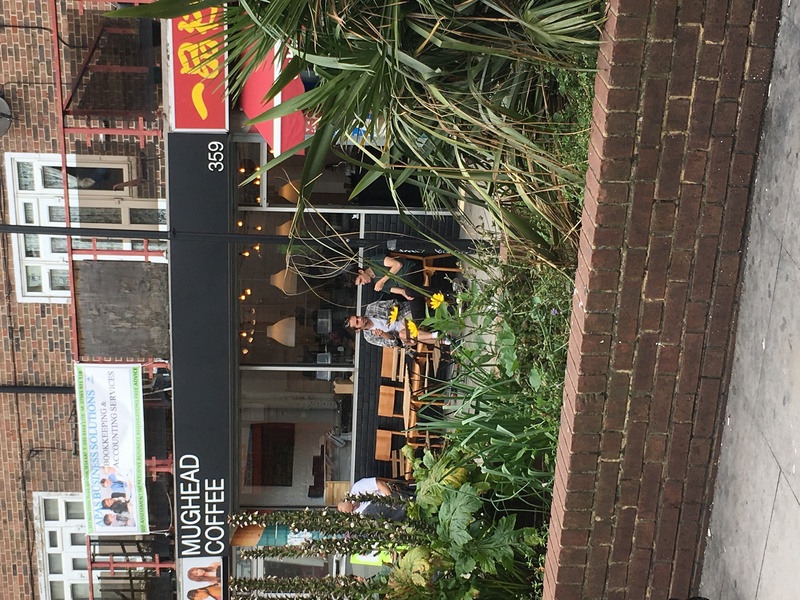 Mughead Coffee opened in July 2017 and sits fronting the A2, part of an old Roman road connecting London to Dover. The large pedestrianised space outside the café provides plenty of room for a few tables together with some further chairs arranged along the café window. It also means that the cafe is set-back far enough from the road that it is possible to sit outside and enjoy the surroundings. Inside, there were plentiful seats but, sadly equally plentiful numbers of occupants relaxing in this new cafe. Clearly this new coffee place in New Cross is proving popular. And why not! Just down the road from the London Particular, Mughead Coffee serves Square Mile in a friendly atmosphere. It is easy to see this becoming a popular local haunt. The usual array of coffees were on offer together with a filter option but as we arrived shortly after lunch, the cake/edible option appeared a little depleted. The interior of the café is quite light and airy with comfortable chairs at the back and more regular seating towards the front. We ordered a long black and a ginger beer and then adjourned to a table outside to await our drinks. The tables outside are arranged on a sloping pavement. This is not really a big deal, but did remind me of a comment made by the lecturer who was trying to instil experimental design into us as undergraduates: The only stable table is a three legged one. However there was not much time to reflect on that as very soon both coffee and ginger beer arrived with a glass of ice. The natural light revealed the oils on the surface of the coffee as they moved with convection. Different convection zones moving in the coffee just as air parcels do in the sky to form mackerel skies or hot lava moves to form different rock formations, both on Earth and elsewhere. Coffee and ice at Mughead Coffee. Note the reflections on the coffee surface. Once the ginger beer was poured into the glass, the ice cubes floated upwards with just a fraction of them bobbing above the surface, the majority of the ice cube beneath. A glance around our surroundings revealed other hints of sub-surface structures. 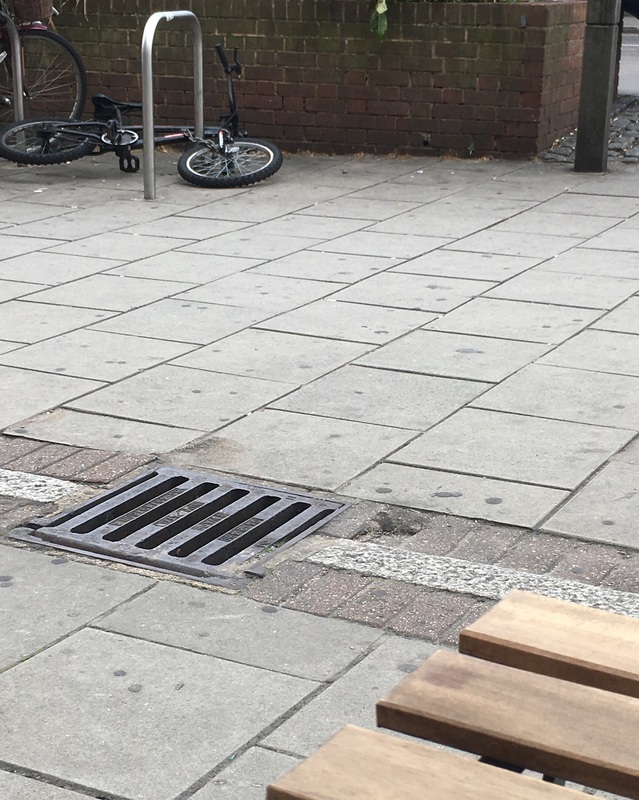 A drain cover nearby indicated, together with some tiling along the pedestrianised zone, the line of the rain sewer running along the road. A public telephone box had no wires obviously leading from it meaning that all the wiring for the communication had to be subterranean. And a raised flower bed, full of thriving plants, had a little drainage hole right at the bottom in order that heavy rain storms did not drown the plants. This last feature reminded me of a documentary I’d recently seen concerning climate change. Often we tend to think of climate change as involving things that we can see: the melting of glaciers or the disappearance of sea-ice, or freaky rain storms that cause local flooding. However there is another aspect, a sub-surface aspect, that has perhaps been far more visually alarming than even the break-off of the Larson A, B and C ice shelves. If only we could see it. The problem is that, as it happens below the surface of the sea, few of us see it, it is hidden from view and therefore easily hidden from our conscience. It is the drastic effect that rising sea water temperatures are having on a particularly unusual plant-animal combination, the coral reefs. Coral reefs such as the Great Barrier Reef just off Australia, are animals that exist in a symbiotic relationship with a particular type of algae called zooxanthellae. Although the ‘mouths’ of the coral eat passing zoo plankton at night, during the day, they get other nutrients from the photosynthesis products produced by the zooxanthellae that live within their skeletons. These plants give the corals those amazing colours (as well as food). In return, the coral provides the plant life with shelter (they live within the coral itself) and extra carbon dioxide. Indications of a hidden architecture. Can you see the drainage hole at the bottom of the planter at the back of the photo? As the sea temperature rises, the zooxanthellae become less efficient at photosynthesising and so of less use to the coral. If the temperature stays high, the coral ejects the plant life from its body causing the coral to lose all its colour, it has bleached. What sort of high temperatures are needed? It seems that if the temperature of the water is about 1-2°C above the usual seasonal maximum, the coral are ok for a few weeks. But if the temperature rise is 3-4°C (or higher) above the usual seasonal maximum, the damage can occur in just 2 days¹. Coral bleaching does not necessarily lead to coral death but if the bleaching is sustained vast areas of coral reefs can die and get destroyed, with significant impact to the local ecosystem. As corals host “nearly one-third of the world’s marine fish species…”² this impact will be far reaching and affect the livelihoods of millions of people³. Although small scale coral bleaching has been documented since 1979¹, the first global scale coral bleaching occurred in 1998. It was 12 years until the next global bleaching event occurred in 2010. Following that, we have just had the third global bleaching event in 2015-16. In the latest episode, it is estimated that 29% of the Great Barrier Reef’s coral died (as in actually died, not just bleached). These temperature increases can be associated with global warming caused by increased greenhouse gases in the atmosphere (for more info click here (opens as pdf) or refer to ). The frequency of these events, together with the fact that there were no global bleaching events prior to 1998 should be a dramatic warning siren calling on us to do something to arrest climate change. But what can be done and is it already too late? Well, it is not yet too late to do something. The plants, thriving in the box in front of Mughead can emphasise to us the importance of maintaining our local environment and by extension our global one. Taking time to slow down and take stock of what is beautiful in our environment, and the habits we need to develop to keep this for future generations, these are things that we can do. If you eat fish, was it caught sustainably? Some fishing methods can kill the coral reefs, check before you eat. This is not going to be hard to do. After all, we already do this with coffee. Many coffee drinkers (and roasters) will check how the coffee is grown and processed for both environmental cost and the conditions experienced by the farmers. Many such small actions can cumulatively build to an effort to stop climate change. Which brings us, in a sense, back to the surroundings at Mughead Coffee. Sitting down and taking time to enjoy that coffee while appreciating our surroundings, the visible and the hidden, the busy road and the mini-oasis of plants in the planter, may help us to see that connectedness that pushes us to accept our responsibility to our common home. Contemplating the history of the road in front of us, will our planet still be beautiful in another 2000 years? 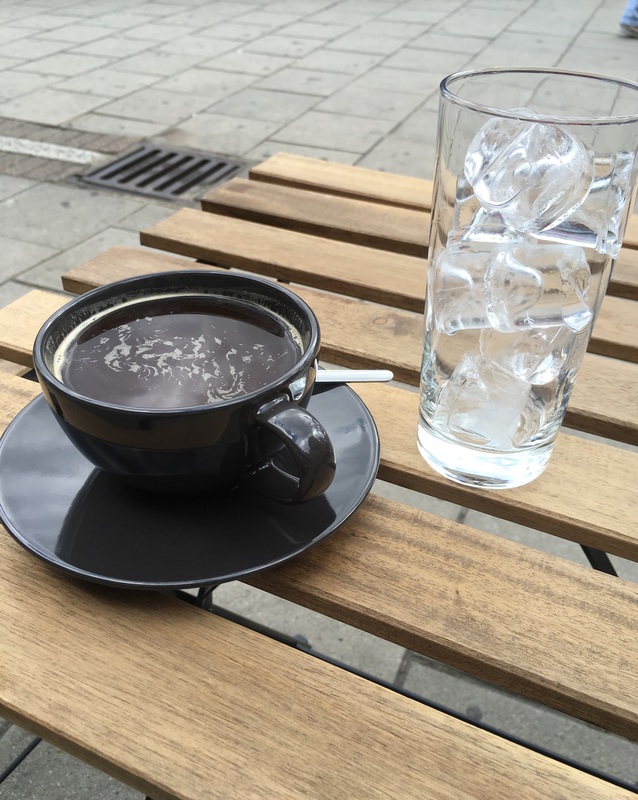 With an offer of “gourmet sandwiches” on the menu (if only we’d got there early enough), there’s plenty of reason to head along to the old road in New Cross and sample the coffee while pondering our own impact on this interesting location.